Last week MYOS RENS Technology Inc (NASDAQ:MYOS) announced positive results of a study conducted at Kansas St. University evaluating the ability of their canine Fortetropin formula to reduce muscle loss in dogs following tibial-plateau leveling osteotomy, or TPLO (i.e. surgery after ligament tear), a common procedure for dogs with cruciate ligament deficiency (CCLR). According to the Journal of the American Veterinary Medical Association, over one million surgeries involving the knee are performed on dogs each year. CCLR is the most common cause of lameness in dogs and one that pet owners are estimated to spend over $1.5B per year to treat (the majority of which relates to surgery). As the leg must be immobilized for weeks following TPLO, muscle loss is a common complication of the procedure. Muscle atrophy is typically evident within two weeks following surgery. And while studies have shown that muscle mass generally begins to return by the fourth week into recovery, significant atrophy remains by week eight. Other studies have shown that affected limbs (i.e. those surgically repaired) maintained just 60% of their muscle mass (as compared to the unaffected limbs) 10 weeks into recovery (chart below) and many dogs show residual muscle atrophy even one year following surgery. 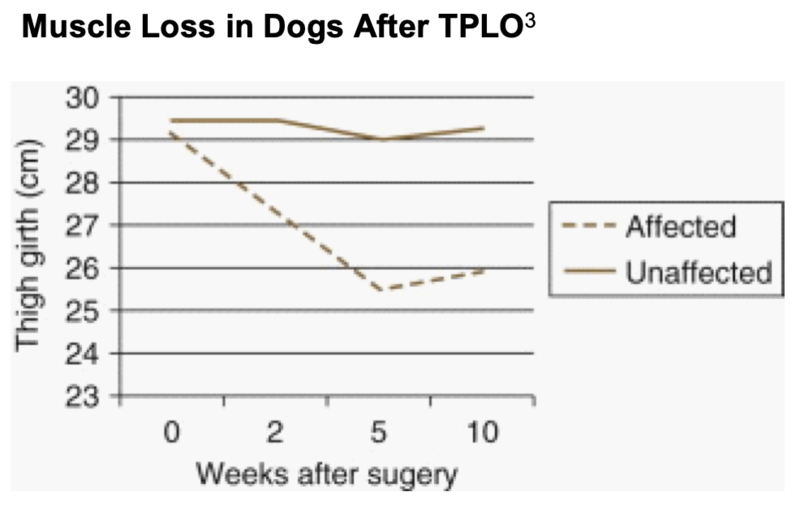 As results of this Kansas St study show, MYOS’s Canine Formula appears to significantly reduce this muscle loss common among dogs that undergo TPLO. The study included 100 dogs, 50 of which received daily Fortetropin, with the other 50 receiving a macronutrient-matched placebo (i.e. daily cheese powder). The dogs were evaluated on change in muscle mass of the affected limb (as compared to the same dogs’ unaffected limb) as measured by thigh circumference and change in weight-bearing capacity (as compared to placebo) – both of which are well-established endpoints in TPLO studies. Topline results were announced in a press release last Tuesday and results were presented by Ken Harkin, Professor and Head of Kansas State’s veterinary program, at the North American Veterinary Community (NAVC) / VMX Conference in Orlando this past weekend. MYOS also noted that there was significant interest in the results from attendees of VMX, which is one of the largest veterinary conferences in the world and attracted over 700 exhibitors last weekend. These results are expected to act as MYOS’ primary marketing message for their MYOS Canine Formula, which launched in June 2018. We expect the company will display these results on their Canine Formula website as well as potentially also including it on the product’s packaging. As we noted in our Q3 update in early December, MYOS wasted no time in generating early awareness of MYOS Canine Formula and in expanding their sales reach. MYOS Canine was featured at the Atlantic Coast Veterinary Conference in Atlantic City, NJ in October. In terms of distribution-reach, upon launch the product had its own website and became available on Amazon.com. Then, in November MYOS announced that Miller Veterinary Supply East, which (per their website) provides “licensed veterinarians the equipment, instruments, pet food, pharmaceuticals and supplies needed to run their practices”, is carrying MYOS Canine, which affords it access to more than 6,000 veterinary hospitals in the eastern U.S. These Kansas State results significantly bolster the effectiveness claims of the product, which is believed to be the first and only evidence-based supplement for supporting muscle health in dogs. MYOS has noted that initial observational studies (including two done at veterinarian hospitals) indicated that their Fortetropin-based supplement may improve mobility. While anecdotal, coupled with positive results of prior studies and positive results of this Kansas State study, the database of evidence is proving to be compelling. The U.S. pet supplements market is worth approximately $600M and growing rapidly. While MYOS Canine Muscle Formula is the company’s first commercial foray into the market, it is not expected to be their last as their intention is to bring additional Fortetropin-based pet products to market. Current customer call-points include veterinarian hospitals, vet practices and direct-to-consumer. The product generated initial revenue of $8k in Q3. Revenue should gain additional traction from the new distribution via Miller East, which came online in Q4, awareness from exhibiting at Atlantic Coast Vet conference in late 2018 and results of this Kansas State study. These Kansas State results also appear to have further energized the company’s foray into the medical nutrition market. MYOS’ Enteral Nutrition Formula is also a first-in-category product for the company – while this represents their initial entry into the medical nutrition space, it may not be their last. In fact, management noted on the Q3 call that they expect to explore additional opportunities in this market – which is one that we think could be particularly attractive given potential for insurance reimbursement. Given that TPLO recovery in dogs has significant crossover to muscle atrophy experienced by humans following certain orthopedic surgeries, such as ACL repair, these Kansas State results may also play a role in helping to guide a similar clinical development program in humans. For example, studies have shown that some muscle fibers of the affected limb may never fully recover following ACL surgery in humans, resulting in chronic loss of quadriceps strength. We expect we will hear more about MYOS’ plans for leveraging these Kansas State results for potentially guiding additional human clinical programs. In the meantime, they will undoubtedly guide their marketing message for their Canine Formula. While our financial model remains unchanged, we have made a slight downward adjustment to our risk discount as a result of the positive Kansas St canine results. Our risk discount has moved from 15% to 14%, which results in our DCF-derived price target moving from $3.50 to $4.25/share.